Imagine a sustainable system that could starve corruption and fight influential crooks with their own unethical profits and revenues, while crooks can only cheat with their devious profits. Imagine a system with infinite potential benefits for your family and humanity, if you join and participate. 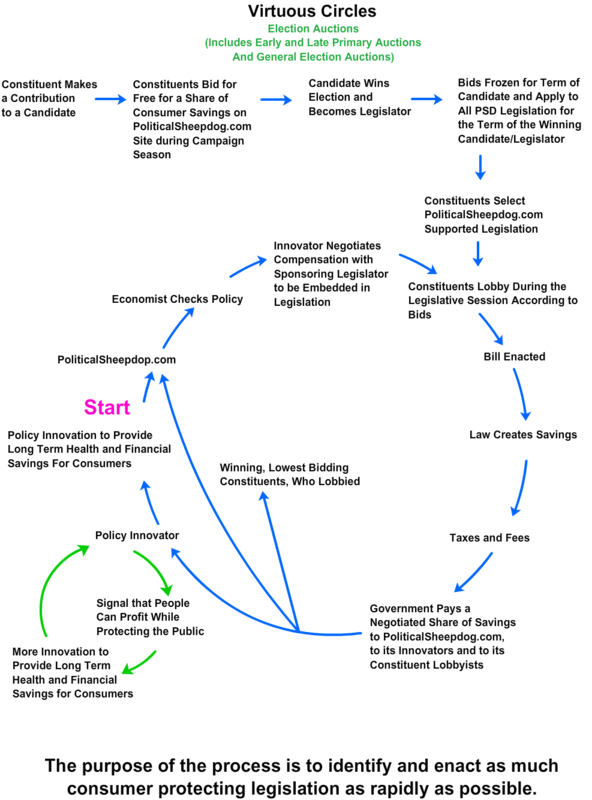 Imagine the only system that can cripple the driving incentives for global warming and for other vicious cycles, which threaten the extinction of humanity, when you join and participate. Imagine an accountable system where the participants only benefit when consumers like you benefit. Imagine a system, already protected by the First Amendment, which is five ways better than an amendment to Citizens United and could make the amendment unnecessary, if you join. 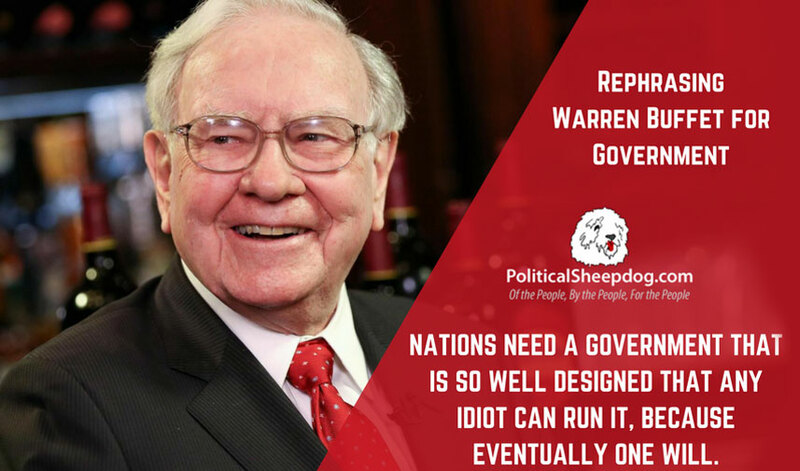 The easiest way to describe Political Sheepdog is that it is like eBay for good government, designed to make the promotion of better government self-supporting and, thus, sustainable. Political Sheepdog is a new system for you to influence government that makes politicians want to protect your interests. Anyone can suggest a consumer protecting policy innovation and any registered voter can participate to support those policies. The system can also provide fair clean compensation to participants, like you. 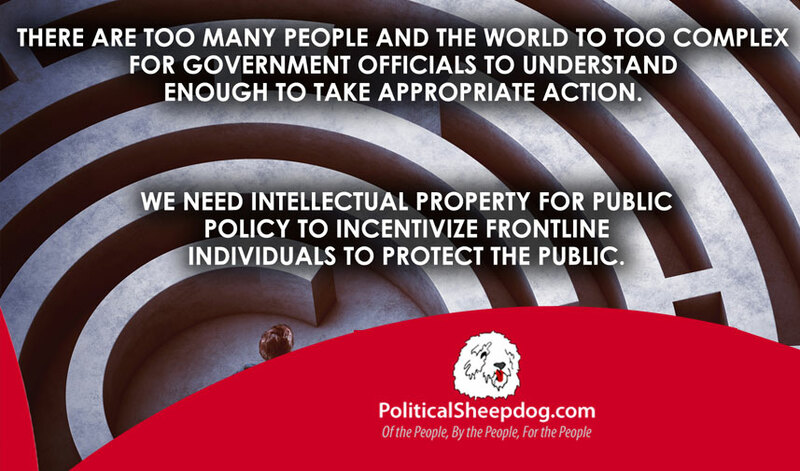 PoliticalSheepdog.com is a sustainable, versatile, constituent-driven, non-partisan, market and intellectual property system for incentive-driven, good government in democracies. Our metric for good government is long term health and financial savings for consumers like you, which is a pretty close definition of the public good. The model behind PolitialSheepdog.com is like the following situation. An inventor creates a machine. This machine could can save a manufacturer $1 million, but the inventor requests and receives half of the savings produced. The model is a win-win situation, because both the manufacturer and the inventor both win. PoliticalSheepdog.com has a similar model. The policy innovators, which could be you, invent policies to protect consumers. Participating constituents like you promote the consumer protecting legislation and contribute to candidates campaigns. PoliticalSheepdog.com uses markets and market equivalents (the marginal revenue product at zero) to determine fair pay. This pay then comes from the savings for consumers. This approach creates a win-win-win-win-win situation, protected by the First Amendment, in which consumers, candidates, participating constituents, policy innovators and PoliticalSheepdog.com all win, when there is a critical mass of participation. Join this potentially powerful online community for educational notices and alerts about available voluntary policy actions to start making a difference in our society today! Don’t Miss the Auction Fun and Excitement in the PoliticalSheepdog.com legislative auctions! Imagine a sustainable system that could prevent or reduce disasters like hurricane Harvey or the 2008 banking disaster, if you register and participate. Imagine a system that you could join for free. Imagine a system in which you can obtain fair competitive income, when you join and advocate to protect yourself, your family, your community, your nation and humanity. Imagine a system where greed and the psychopaths on Wall Street will work in your favor to protect you, if you join and participate. Imagine a system where day care providers and teachers were not underpaid. 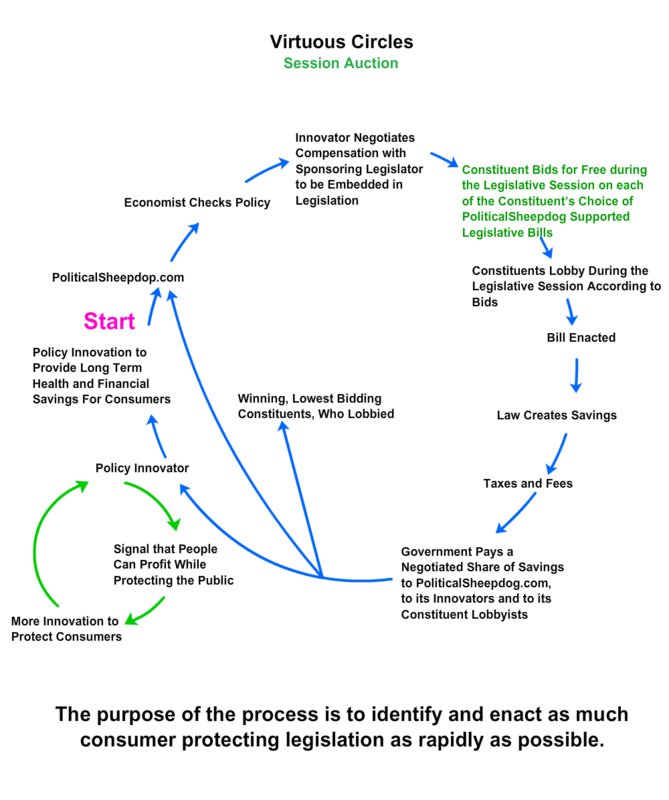 Imagine a virtuous circle that corrects the way money drives democratic governments to improve the certainty that governments will quickly protect the public like you in far superior ways from any known and new threats. Imagine a system which encourages political parties to cooperate, if you register and participate. Imagine a system that pleased Senator Elizabeth Warren, TV pundit Norman Ornstein of the American Enterprise Institute, Noam Chomsky of MIT and Dean Jonathan Levin of the Stanford Graduate School of Business. Imagine a more moral, psychologically based, tax system, where taxes were based on how the income was made or the quality of income and not simply the quantity of income. Imagine a self-correcting system in which concerned citizens like you have adequate incentives to correct mistakes, reform unforeseen consequences and rectify intentional misdirection. Imagine a system that could reduce deficits with less pain due to efficiencies, if you register and participate. Imagine a nimbler system that can react quickly to prevent threats to you, your family and the public, if you join and participate. Imagine that the First Amendment protected this system and it was legal. The only system with the above potential and more isPoliticalSheepdog.com, if you register and participate. Connect legislators and constituents like you to one another. Spark the creation, improvements, or propagation policy ideas, and draft legislation that protects you and other consumers. Motivate legislators to respond to their constituents’ needs, and not to their corporate and big money donors. Give constituents like you incentives to donate to election campaigns. Organize constituents like you to lobby their legislators. Find fair, ethical, competitive compensation for individuals like you, who create and support consumer protecting policies. 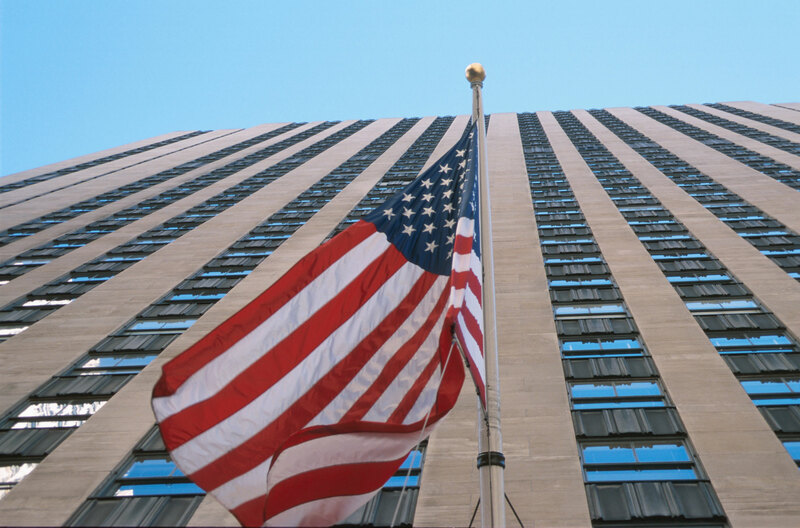 Our mission is to protect you and your children by correcting how money drives governments. Our website will motivate you and others to connect and to engage with legislators, to create policies and to provide campaign contributions. In doing so, we will change the incentives driving politicians and, thus, change government. These incentives will also tie our interests to your health and to cost reductions for you. Please click on the Facebook, Twitter and other icons on the left side of the screen to post PoliticalSheepdog.com to your pages. Please urge your favorite radio stations, TV stations, newspapers, including college newspapers to do a story about PoliticalSheepdog.com. If you have recently contributed to a campaign, please register with PoliticalSheepdog.com to allow us to create the database for auctions in your state, county, or city. Please ask your favorite candidate(s), to whose campaign(s) you have contributed, to contact PolilticalSheepdog.com and to ask how PoliticalSheepdog.com can attract constituent contributions to their campaigns. 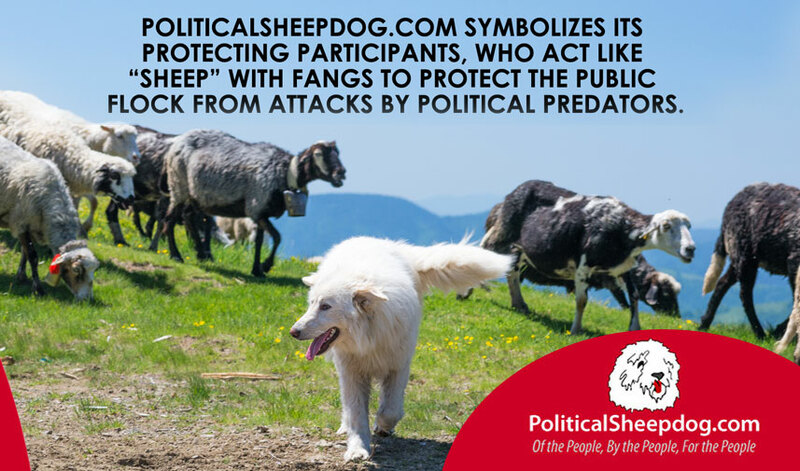 Learn more about how Political Sheepdog works and discover what kind of “sheepdog” you are. For those viewers, who would like to study PoliticalSheepdog.com in greater depth, please click here and read the first and second chapters. Also, If you like what you see, please click the Facebook icon on the left of the page and post us on your Facebook page. In addition, please follow us on Twitter at https://twitter.com/politicsheepdog and Facebook at https://www.facebook.com/PoliticalSheepdog/. Interested in compensation, when you promote consumer and taxpayer protecting legislation to legislators?